George Rodrigue, known as ‘Big Rod’ to his teenage peers, graduated from Catholic High School in New Iberia, Louisiana in 1962, along with thirty-two classmates. 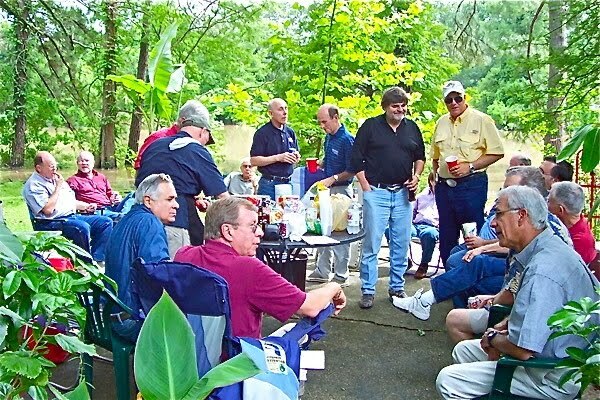 They have an annual reunion in someone’s backyard (BYObeer), women not permitted. This is a group of guys that remembers a time when “if you could drive, you could drink,” and so their stories from age fourteen and fifteen sound like most people’s college reminiscences today. 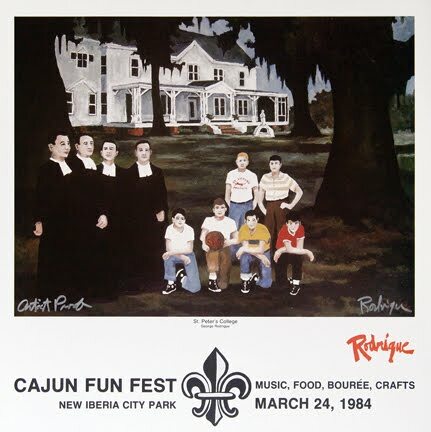 They parked their ’57 Chevys, ’48 Fords, and ’56 Plymouth Station Wagons on the Bayou Teche in City Park across the water from the Christian Brother’s Home (also called St. Peter’s College, pictured below in an early photograph and a Rodrigue painting/poster). There they hooked up (necked? made out?) with their girlfriends in the backseats, as the Brothers spied on them from across the water, delivering reprimands the following Monday to the owners of any recognized cars with fogged up windows. Yet his friends made it fun, and he becomes a kid again when reminded of shooting BB guns with Dickie or the inappropriate (and confusing) sexual questions posed in class by ex-seminary student Wilton David. 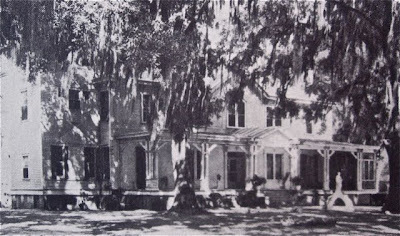 George even spent six months at age eighteen meticulously removing the black stain from the grooves of his Catholic High class ring, purchased in 1961 for $24, so that it would appear solid gold (a ring he wears daily, even now). 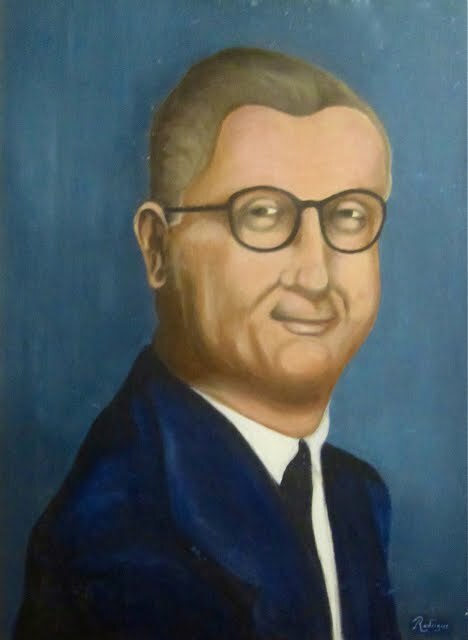 And he took commissions, such as this portrait of the local funeral director, George Burgess, which hangs in George’s studio today, because the Burgess Funeral Home refused to pay the agreed-upon price of fifty dollars. About twelve years ago Brother Cecil and Brother Edward began showing up at George’s book signings, dressed in their robes and anxious to share stories with the crowd, usually about George and his “juvenile delinquent” friends. 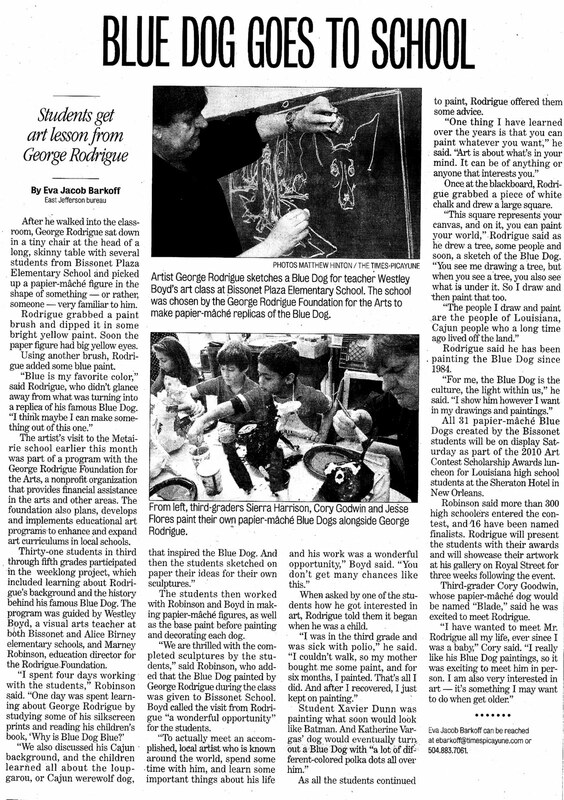 They marveled (in fun) that George ever graduated. “Brother Isidore reminded all members of their duties as Sodalists --- to always carry their rosaries, to attend Mass on Tuesday and to use their Book of Meditations daily.” (Anyone who knows George personally is laughing at this mental picture). 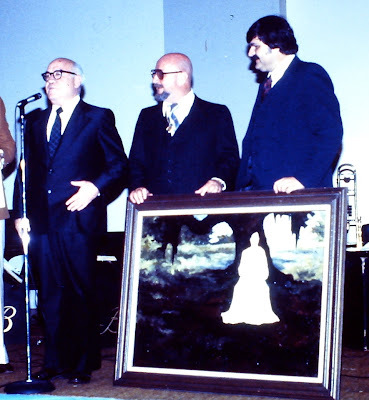 He convinced George in the mid-1970s to donate a painting of Evangeline to the Christian Brothers Foundation as a gift for jazz musician Pete Fountain, a great supporter of the Christian Brothers School (pictured below, from left Brother Edward Scanlan, Pete Fountain, George Rodrigue). This began a friendship between George and Pete that continues to this day, including George’s Jazz Fest poster from 1996 of the great clarinetist. George refused the cash and again handed over the prints. Thus began an annual tradition (moldy money, refusal, free prints, big bucks), continuing until Brother Edward, the last living of George’s teachers, died in 2006. 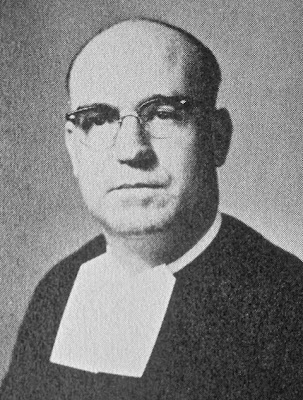 I knew Brother Edward for ten years, and George tells me that he was exactly the same in looks and temperament since New Iberia in the 1950s (pictured below as Brother Isidore, age thirty-six, from the Catholic High 1956 yearbook). George loved visiting with Brother Edward in recent years. Occasionally we stopped by the Christian Brothers School (CBS) in New Orleans’ City Park and spent the afternoon with him in the elegant 1900 sitting room. At his request we held a special lunch with some of his former students at K-Paul’s Louisiana Kitchen in the spring of 2004. 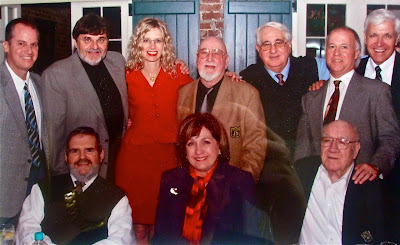 The small gathering turned out to be a Who’s Who of Louisiana (... and me). 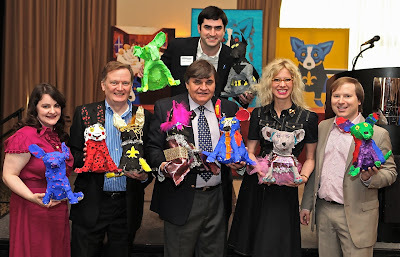 Since losing Brother Edward, George continues supporting education in Louisiana, especially with the George Rodrigue Foundation of the Arts (GRFA). Established just one year ago, the foundation advocates the importance of the visual arts in childhood education. 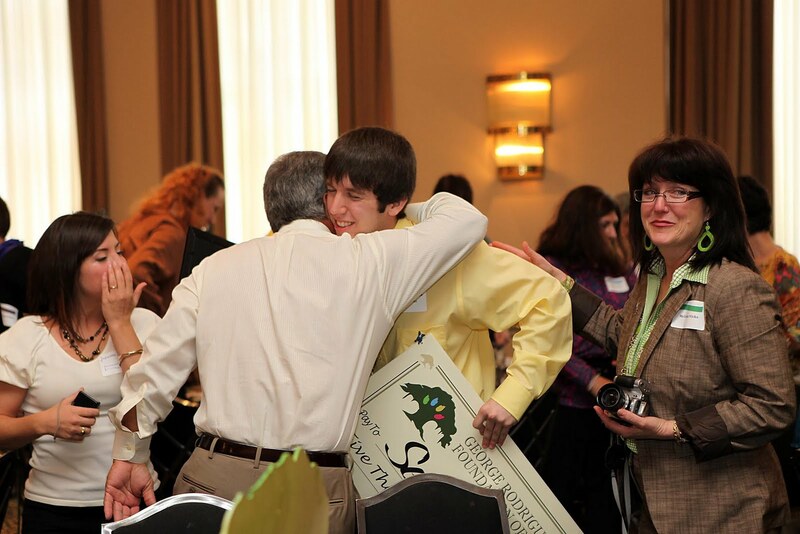 Although the foundation offers art supplies, education manuals, lectures, and other opportunities, its main project is a scholarship contest open to seniors throughout the state. More than half of the students, including their parents and art teachers, visited New Orleans for their first time ever this past Saturday. 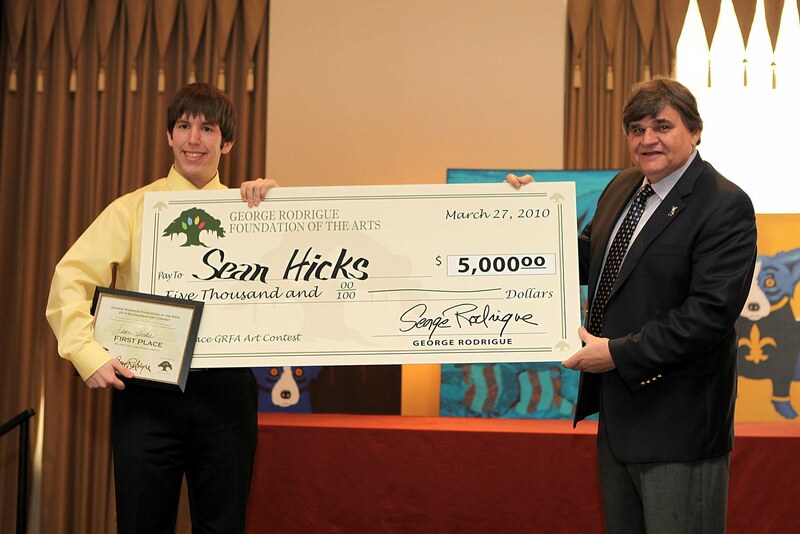 Every family and art teacher had a winner, because each of the sixteen received $250 in art supplies, plus a Rodrigue Super Bowl print dedicated to them personally, plus additional scholarship money, ranging from $500 to $5000 depending on their placement (determined by our judges, made up of artists, musicians, reporters, museum directors, and other prominent members of Louisiana’s cultural community, all of whom donated their time for this project). In addition, we’re holding a three-week exhibition of the artwork from all sixteen finalists at the new Rodrigue Gallery at 730 Royal Street, followed by a show at the Louisiana School for Math, Science and the Arts in Natchitoches and the Louisiana Governor’s Mansion in Baton Rouge. We decorated the tables for this event with papier maché dogs created recently by a local third grade class during George’s visit to their school. The little dogs are now on tour! They appeared first at our client event weekend this past March 19-21 and afterwards as table decorations for the scholarship banquet. 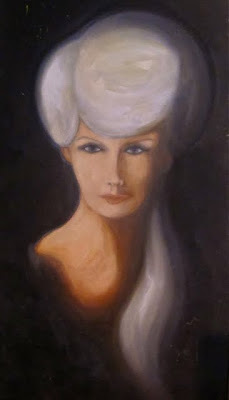 Next stop: Lakeside Mall in Metairie, Louisiana, across from the Blue Dog Sculpture. 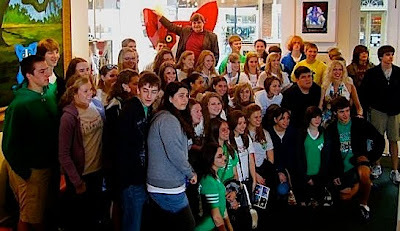 As if this week, after the Rodrigue’s New Orleans client weekend, the GRFA Scholarship Banquet, and the beautiful spring weather, couldn’t get any better, we hosted fifty students in the gallery from Choctawhatchee High School on Thursday morning, visiting from Fort Walton Beach, Florida. 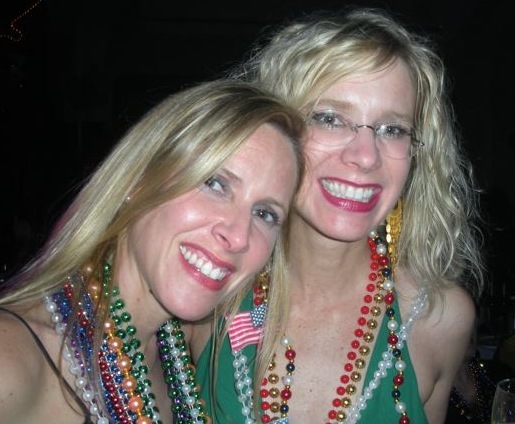 Those of you who follow this blog know that Fort Walton is my hometown. And although I attended the rival high school, this was the next best thing to home. 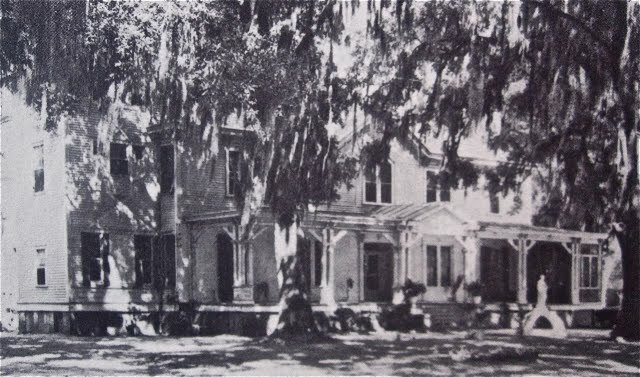 I’m excited about my twenty-fifth class reunion this June at the Ramada Inn on the beaches of Okaloosa Island, just down the street from where I lived with my mother and sister. Heather Parker (my sister, who manages the Rodrigue Gallery website) is attending with me in George’s place, because she knows so many people from my class, and because it’s hard to think about high school (or any part of my life) without her. High School memories resound for all of us, but I couldn’t help but think this weekend as I looked out among those 17-year-old faces, how bright our future seems in the eyes of these inspired ‘Big Rod’s.’ I didn’t see my tainted Vietnam War and 9/11 pessimism in their eyes. I didn’t see George’s imminent draft notice or limited market for his paintings. 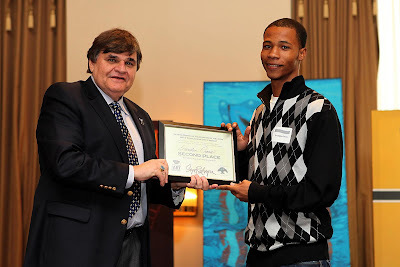 Rather, I saw an intelligent, computer-savvy generation; I saw proud (oh so proud) parents; I saw driven, determined young people; and most important, I saw the goodness in their hearts and the joy they felt for each other as they came that much closer to achieving that next important step: a college education. Great work! Inspiring young artists gets tougher every year, and what George and you have done is maginifcent. I am sure his Christian Brothers teachers would be proud to see George "paying it forward." 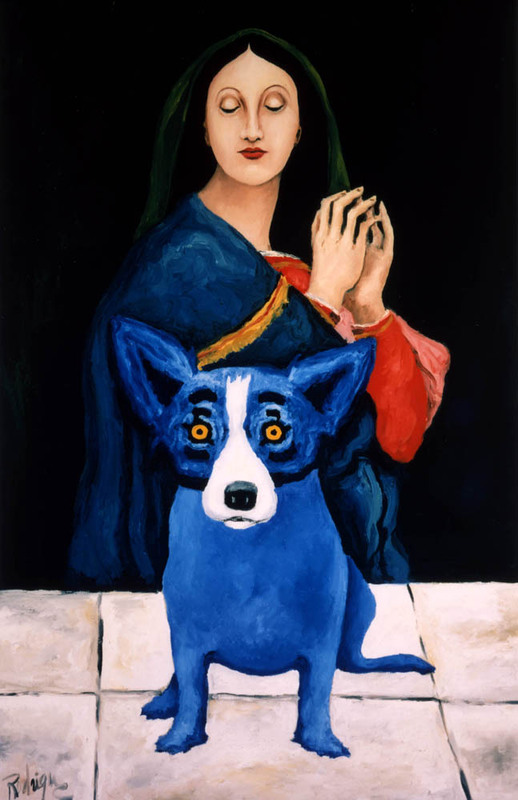 I remember a Rodrigue painting of Cheryl Courrege Burguieres hanging in her dining room in Houston. 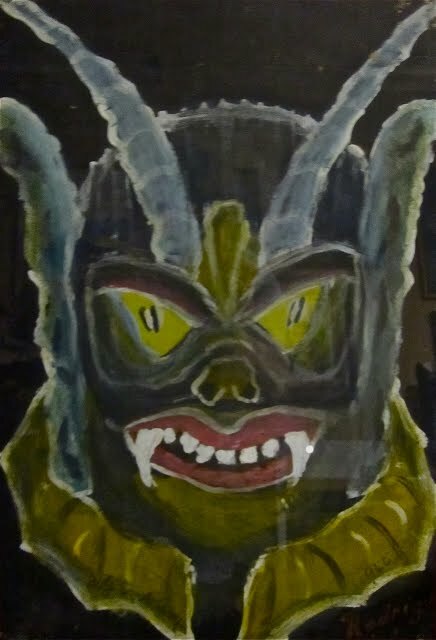 Are there prints available? She was a friend from long ago --- one I have never forgotten.